Have you ever noticed that there is a surprising dearth of waterfront restaurants in San Diego proper? It seems like every time I want to have a relaxing business lunch with a little whiff of salt air, I pick the same three places. With everyone overly enamored with Little Italy and the Gaslamp, I think I found a treasure right in our own Pacific Beach. 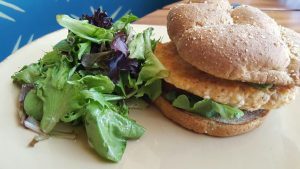 While most dining in PB is distinctively casual and burger-laden, Oceana Coastal Kitchen in the Catamaran Hotel is pretty special. It’s sure to impress a local or out of town client. Heck, it’ll impress anyone you take. While hotel restaurants usually don’t top my list, Oceana is really special. The Catamaran Hotel is looking pretty spiffy these days with waterfalls, tropical birds and top end hospitality. Oceana is toward the back of the hotel and faces Mission Bay at its most pristine point. Grab a table on the patio and watch all of those vacationers who only get to come here on occasion and realize how lucky we all are! I always leave Oceana feeling like I had a super-mini escape. There is an amazing gazillion gallon circular aquarium in the center of the restaurant full of live Jelly Fish. Trust me…with their fluid movements and almost balletic flow, this thing needs to be in every therapist’s office nationwide. Total Zen. The service is casual, but spot on and the food is fab. 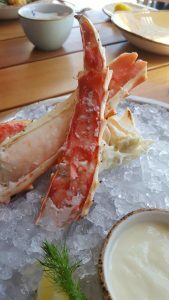 I always love to order the chilled Alaskan king crab legs which arrive on a plate of crushed ice, perfectly structured by a clearly knowing chef. How can you not love watching joggers, sailboats and people in a total state of relaxation saunter by while you feast on fresh, sweet crab legs? The menu is loaded with other delectable choices as well. The Tarragon Shrimp Salad Sandwich on Brioche with Jicama Slaw is truly creative and palate pleasing. There are several salads, including the Kale/Chicken/Apple, Citrus Salmon with Champagne vinaigrette and a good old fashioned hearty Cobb. The Flatbreads are a great way to start if you’re making this a marathon lunch. Three mushroom (Cremini, Shitake and Oyster) with chive is my fave. Add the sushi bar and you’re good to go! So check this place out for a sure to impress lunch, and go back for dinner sometime. It’s a place that will enchant and surprise your guests. Prices are moderate and there is complimentary parking. Just make sure they validate your ticket in the restaurant. It captivates me every time.